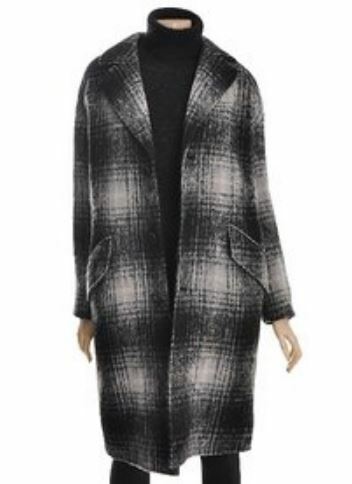 Just on a side note, I didn’t realize until I tried looking for similar style coats that it was so hard to find a decent and not cheap looking plaid coat of good quality. I never realized it before, but I also tend toward only wearing solid colors. I think it’s because of the general view that you can always wear solid color coats over again, but for some reason plaids are easier to spot. However, that line of thinking seems off, since it’s not like your colleagues or friends won’t notice that you’re wearing the same black or brown coat again. I’d be open to anyone’s thoughts on this. 1. Shaggy and Distorted Navy Plaid Coat – sponsored by Siero. According to their facebook, Siero provides “lifestyle contemporary clothes.” For more info, check out their FB page HERE; it includes the times that other celebrities including Im Shi Wan of Misaeng wore their clothes. From what I can see, the original coat can be found on CJ Mall’s website here, which is part of Hyundai. 2. Luckychouette – Red Plaid Coat – sponsored by Luckychouette. According to their website, they target the global customer with a hybrid smart/casual style that incorporates humor and graphics. Here’s their FB page. Sorry, I couldn’t find it on their website… I think this is an in-stores only thing. This was an interesting piece because the coat is designed to be obviously feminine and cute. I think So Eun pulled it off great with the black hat to emphasize the hippy cute look, but it’s difficult to pull off in societies that are less “into” the cute look. When looking for similar alternative, I took a lot more artistic liberty. THE DREAM – Martin Grant – Simple but the details really shine in this one…the more you see it, the more it looks lovely and well crafted…Something about the lines and the solids… <3_<3 More info found here. FYI – Martin Grant is an up-and-coming fashion designer, originally from Australia. He is known for “pure lines, which are both simple and spectacular” as his styles have an element of modern art and a resemblance to sculptures. THE SPLURGE – Theory – The “shaggy and distorted” blending of the colors reminds me of So Eun’s cat and differentiates this one from the run of the mill plaid coats. Since the plaid kind of blends into one another, I think it gives less of the refined pattern look, making this easier on the eyes and a safer choice to wear multiple times ^^ More info found here. THE CONVENTIONAL – Soia & Kyo – This one strays from the plaid into more of stripes. I’m sorry, but none of the more economic options of plaids really looked decent in my opinion. The one thing about a plaid coat that is simply plaid with a well defined and clean pattern is that you risk it being easily recognized or remembered… That’s why the three that I highlighted today fall into the blended plaid category. More info found here. 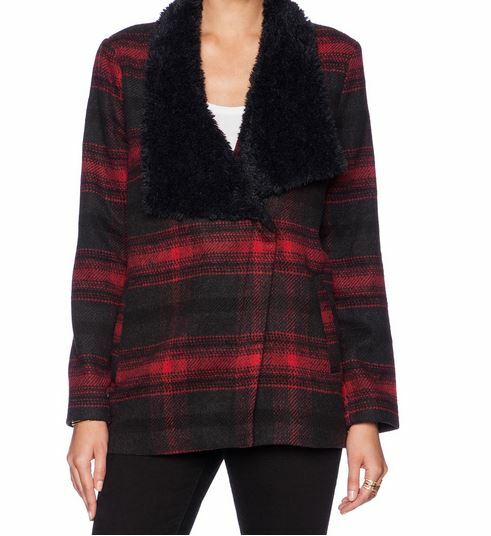 THE SPLURGE – Stella Jean – Again, I’m highlighting a more blended red plaid. While the outlined red plaid worked for So Eun, I hesitate before opining that it’s a good staple for any closets… Now a blended red coat, would be a statement piece that you could rock every two weeks and still look stylish. More info here. THE CONVENTIONAL – BB Dakota – This is more of a plaid but shorter length coat… I have to admit, there were very few pieces that were in red plaid that didn’t remind me of a lumberjack or a farmer… Though, we’re really only taking So Eun’s jacket as an inspiration here, I thought this was a cute jacket for the warmer winter days. More info here.